It’s time to Fork it Over for the Westport Farmers’ Market Party in the Parking Lot! 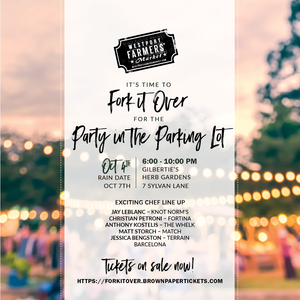 The Westport Farmers’ Market annual Fork it Over Party in the Parking Lot is back! The event will be held at Gilbertie’s Herb Gardens on October 4, 2018 from 6 to 10 p.m. and is the largest WFM fundraiser and tribute to supporters. Adults from all over Fairfield County and beyond gather in a magical scene of music, café lighting, and the almost-unbearable aroma of local food to celebrate WFM’s programming and the bounty of the season. Logical perhaps, but this party promises to be like no other. Guests will be greeted with an espressotini featuring Raus coffee. Mecha will furnish seasonal cocktails in a bar truck sponsored by Olive + Julep while WFM ensures the flow of beer and wine, with music by a jazz trio and local favorite Big Yachty. The Party in the Parking Lot! will be this year’s largest fundraiser in support of the Westport Farmers’ Market, a 501c3 organization that reaches over 30,000 consumers per year throughout Fairfield County. People are encouraged to mingle and take their chances on drawings that highlight items such as dinners, music, travel, home goods, design consultations, and lots of surprises. This year will also feature the final round of the Chef at the Market Competition, where three finalists will compete for the Best of the Westport Market chefs.